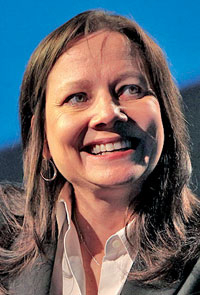 Mary Barra is GM's global product development chief and a member of Opel's supervisory board. PALM BEACH, Florida (Reuters) –- Dan Akerson, CEO of General Motors Co., said that the automaker's most senior woman executive, Mary Barra, is one of his potential successors. Akerson added that women deal with change better than men and GM still has a lot of changes to make since its 2009 bankruptcy and $50 billion government bailout. The CEO said it was critical for the world's largest automaker to boost the ranks of its top female executives. He said Mary Barra, 50, the company's global product development chief and a member of Opel's supervisory board, is a candidate to succeed him. "I wouldn't be surprised if she were, but I wouldn't handicap it today and I think there are a good number of candidates," Akerson, 63, told a conference on Monday in Palm Beach, Florida, that discussed women in the economy. "It's the board's job (to pick a replacement), not mine." Akerson also said the U.S. Treasury, which still owns slightly more than a quarter of GM's outstanding stock, was not involved in decision making. "I know I've done things that have annoyed the U.S. Treasury." Asked if taxpayers will get their money back, Akerson replied: "I don't know." Akerson, who joined the company as it emerged from bankruptcy, has said he would prefer the next CEO to come from within GM but the board would decide. He gave no time frame for his exit and said he would stay as long as he was making a contribution and the board wanted him. Analysts say other candidates to succeed him include Vice Chairman Steve Girsky, 50, like Barra a member of Opel's board, and North American operations chief Mark Reuss, 48. Explaining why he wants to ensure that women at the company are in positions beyond "softer" jobs such as human resources, he pointed out that he has two daughters and also said his mother, who worked as a cashier at a grocery store and rose to become a manager, had a greater impact on him than his father. Akerson said women make up 20 to 25 percent of GM's top 50 executives. "Four of 12 of our directors are women, one of our women runs Europe and some of our biggest plants are run by women," he said. "Twenty percent of our technical staff are women. We seek women with engineering degrees." Barra joined GM in 1980 and has had various manufacturing and engineering jobs and was vice president in charge of global human resources. She was named senior vice president in charge of global product development in February last year.